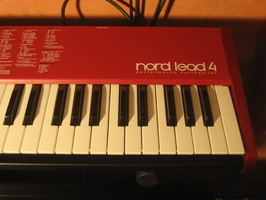 Nord Lead 4, Analog Modeling Synth from Clavia in the Nord Lead series. 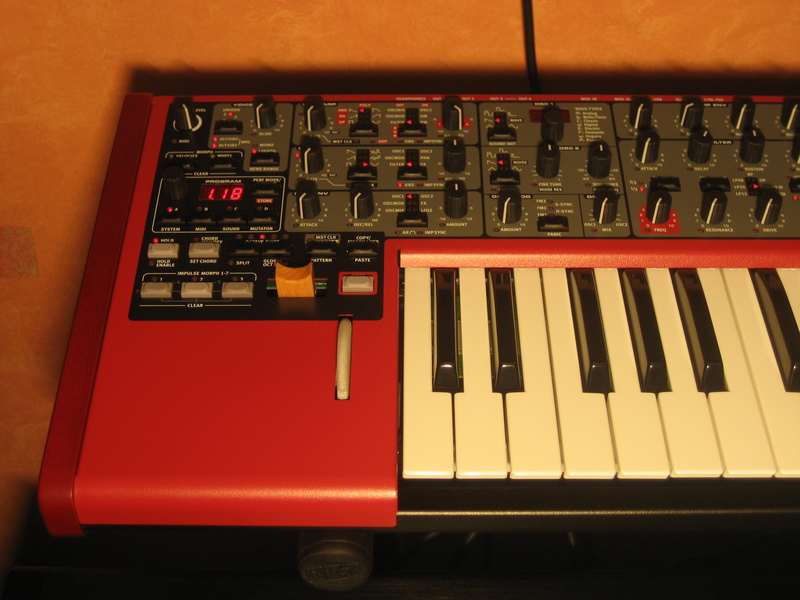 Five years after launching Nord Wave, Clavia has once again updated its stage-synth range. 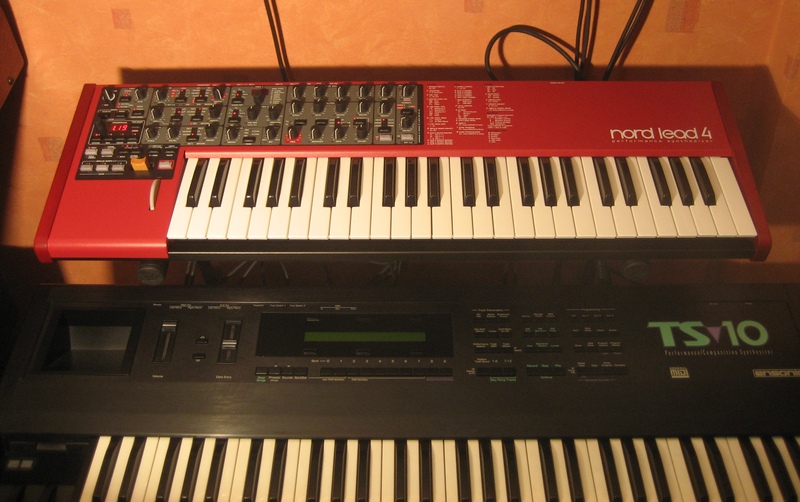 What surprises does the Nord Lead 4 offer? Except for the Nord C2D, which looks like an OVNI, all Nord products are easily identifiable at first sight, and Nord Lead 4 is no exception to the rule. It has a metal shell with red paint and gray/back solid colors, gray buttons, and a small LED display; nothing but classic stuff — good classic stuff! The build is solid, while the granular paint and the painted wooden sides give it a classy touch. The knobs sit perfectly tight and inspire confidence. The unit features an internal power supply with small vents to let the heat out, but it doesn't really get hot. At only 12 lbs. 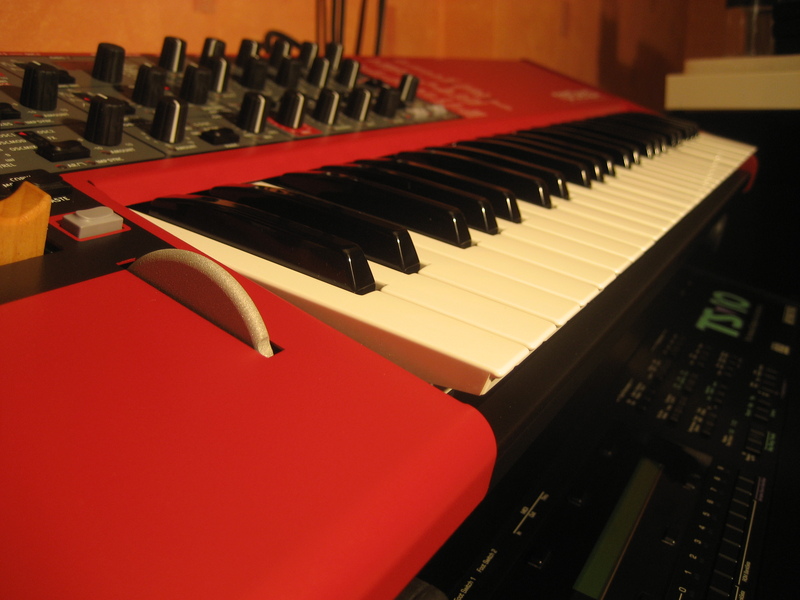 and 34" (keyboard model), the Nord Lead 4 is a real stage beast! There's also a rack-mountable 3U version: Its front panel has an ideal angle for editing, while its oblique rear panel simplifies connections. The rack version represents a significant improvement on previous modules of the brand, with lots of parallel sides. The four-octave keyboard is dynamic (velocity sensitive) but not pressure-sensitive, which is unacceptable in this price range. 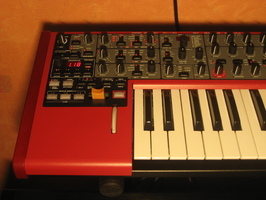 It reminds me of the Nord Wave, which features a not-so-terrible aftertouch, in terms of feeling, and is limited when it comes to destinations. In this case, the overall response is rather soft with little resistance and the keys are short (13 cm). The keyboard is definitely not one of the highlights of the Nord Lead 4, especially when compared to the other synths in this same price range! 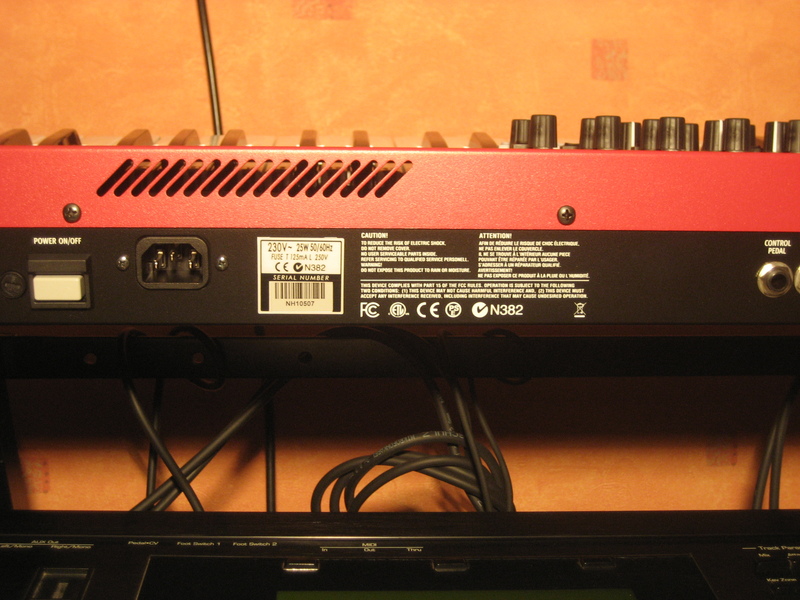 As usual, all controls are gathered on the left side of the top panel, a design choice that can be explained by the following principle: we play with the right hand while tweaking sounds with the left (Nord has announced a Nord Lead 4G for lefties with the control panel on the right, available 17 days after Musikmesse 2014). The only inconvenience with this approach is that the control density is pretty high and the size of the controls small, especially considering that the number of functions has increased, as we will see later on. As a consequence, you often have to use the Shift key as a modifier (for the arpeggiator, noise and effects). The Nord has 29 knobs, 2 detented encoders and 34 buttons, complemented with lots of round and triangular-shaped LEDs for us to enjoy. All are logically spread across the top panel (from left to right: modulations, oscillators, filter, amp, effects), except maybe for the volume envelope which is awkwardly placed above the filter section. Among the best ideas are two transpose buttons, ranging more or less two octaves, and the Chords function, which lets you save a chord and replay it, transposed. There is no "compare" button, however, and the buttons only work in "jump" mode. We were pleased to find that Nord has again included a spring-mounted, wooden pitch stick, with no central position, plus the "stone-effect" mod wheel. 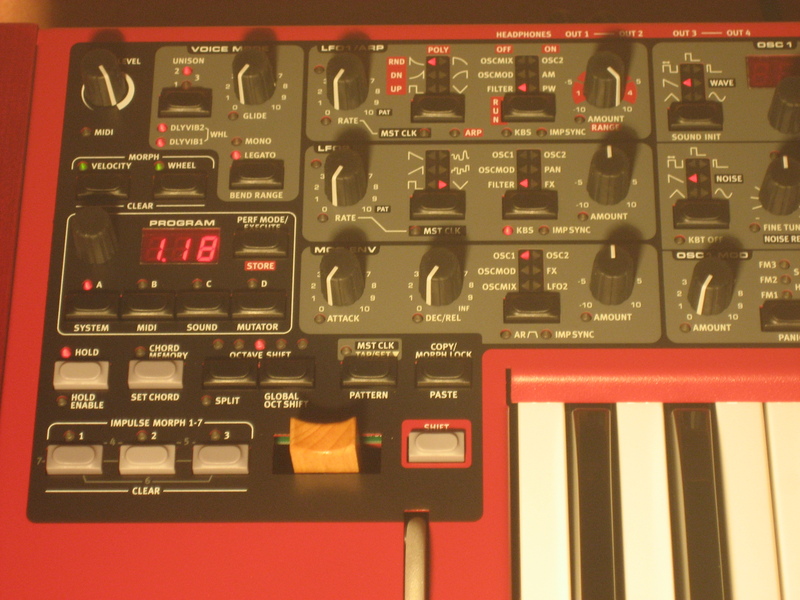 By contrast, the generous LCD of the Nord Wave hasn't survived. Instead, there's a three-digit seven-segment display (with decimal period), which seems a bit cheap considering the price of the keyboard. It displays the program numbers, the value of the functions currently being edited, and also allows you to adjust the general parameters, which are written to the right of the control panel in the keyboard version, and underneath it in the rack version. Oscillator 1 features an identical display to make advanced wave selection easier. 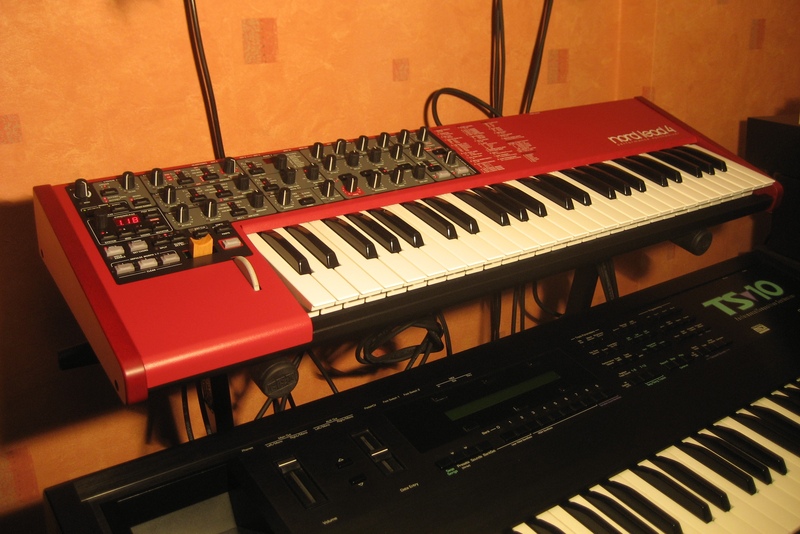 In relation to the Nord Lead 3 and Nord Wave, the usability has gone a step backward, even if the handling remains very comfortable. All connections are on the rear panel and include four audio outputs (two stereo pairs or four individual outs), MIDI In and Out/Thru (switchable via the menu), a USB port (MIDI), two pedal connectors (sustain and modulation), and the connector for the power cord with a big and well-protected switch. Very classic indeed, although it lacks an audio input and digital audio options. 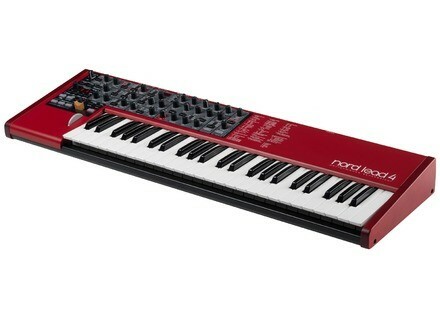 The Nord Lead 4 is a four-part, multi-timbral, polyphonic, analog modeling synth with 20 voices. It includes 396 programs and 99 performances of four programs in the internal memory. It also comes with a free PC/Mac sound manager. Just listening to the factory sounds brings a smile to your face. 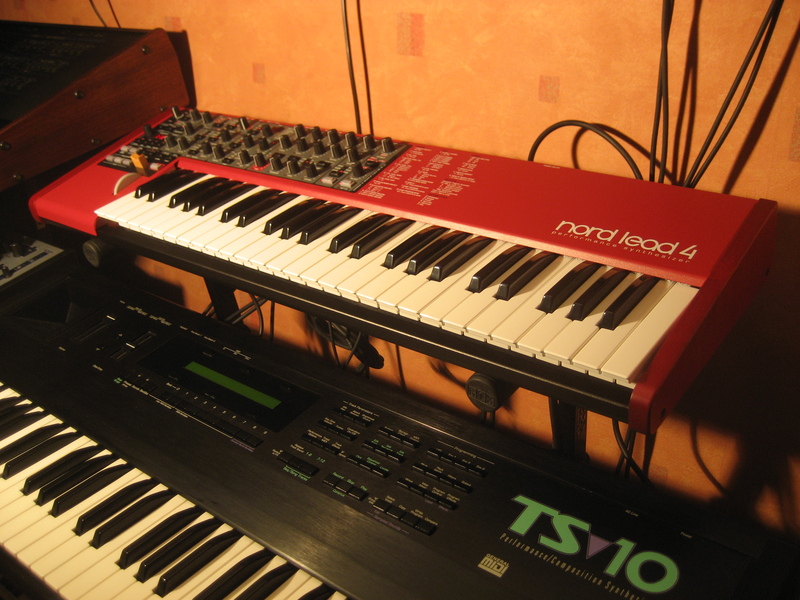 Nord Lead 4 is faithful to the great Nord tradition: warm, fat and extraordinarily powerful sounds. The oscillators are rich and powerful, and in addition to "analog type" waveforms, the first oscillator offers digital single-cycle waveforms, like the hybrid Korg DW or SCI VS from the '80s: bells, organs, formants, pianos… the collection of sounds is very large. The filters sound really good and Nord has added some new ones, including models of the diode and transistor ladder filters in the Minimoog and TB-303, respectively, which are an ideal complement to the rest. The first one has a sharp distortion and oscillating resonance, while the second one provides warmth and a non-oscillating acid coloration. A truly good idea that provides very different musical results than with other filter profiles. The envelopes are fast, which guarantees sounds with punch and attack. Effects are also included: bit reduction, distortion, compression, formants, comb filter, delays, and reverbs. The reverbs are a bit metallic, so keep the brightness low! You can do some morphing between different profiles (more on that later) with the wheel or playing with the velocity, which is ideal for lead sounds and pads. 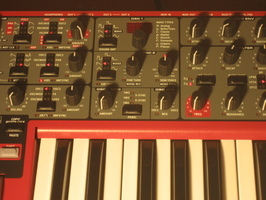 A new feature, in regard to previous Nord products, is the Impulse buttons. They allow you to toggle instantly between up to seven variations of the same program, with even more modifiable parameters. Sweet! 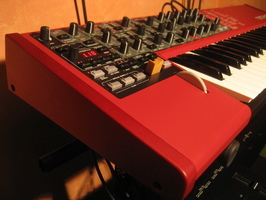 Nord Lead 4 is highly versatile and covers all sonic territories: analog imitations of different sounds, digital hybrid/FM textures, evolutionary pads, punchy percussion sounds, special effects and drones — the audio level is very high and the quality is excellent: no noise nor untimely aliasing, as long as you don't turn the knobs like a madman while playing with inter-oscillator modulations (pitch, FM…). The excellent first impression we had in Frankfurt is confirmed in terms of sound! Before we start talking about synthesis, those of you who love randomness or genetic combinations can use the integrated Mutator feature. Roughly speaking, it means that you start out with a sound to which you add successive mutations, be it starting always from the original sound, taking the previous mutation as a reference or in a totally random way. The mutation level (the discrepancy between sounds) can be specified according to five values. There is even an Undo option to go back as many as 10 mutations. Nice. For those who want to go into the details: there are two oscillators, one filter, one amp, two LFOs, and three envelopes per voice. 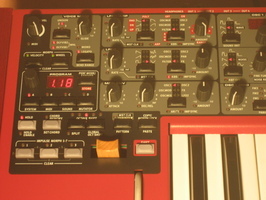 The first oscillator is the beefiest: apart from the basic modeled waveforms (sine, triangle, sawtooth, variable pulse wave modulated by the LFO1, square, fixed-pulse), it provides 92 basic single-cycle digital wavetables: "analog" waveforms, bells, piano, formants, and organs, to enrich the sound palette and escape the never-ending emulation of analog synths. No regrettable aliasing up to this stage. The second oscillator uses the same basic modeled waveforms, while a noise generator with variable color and resonance replaces the digital waveforms. Keyfollow can be disabled from oscillator 2, which can prove very useful with certain sync or FM sounds. You can also detune the oscillators in half steps (more or less five octaves) or even in finer steps (more or less 50%). Oscillator 2 can modulate oscillator 1 according to three levels of linear FM. Osc 1 can also be synced to a virtual master oscillator according to two levels of "hardness." The amount of FM/sync modulation can be adjusted and modulated, and this is where some aliasing starts to appear whenever you modulate too fast. The level of both oscillators is mixed (balance pot) before going into the filter. We would've preferred two separately adjustable levels with the possibility to distort the filters at the input. Unfortunately, that's not the case, but certain filter modes are conceived to distort naturally, as we will see. 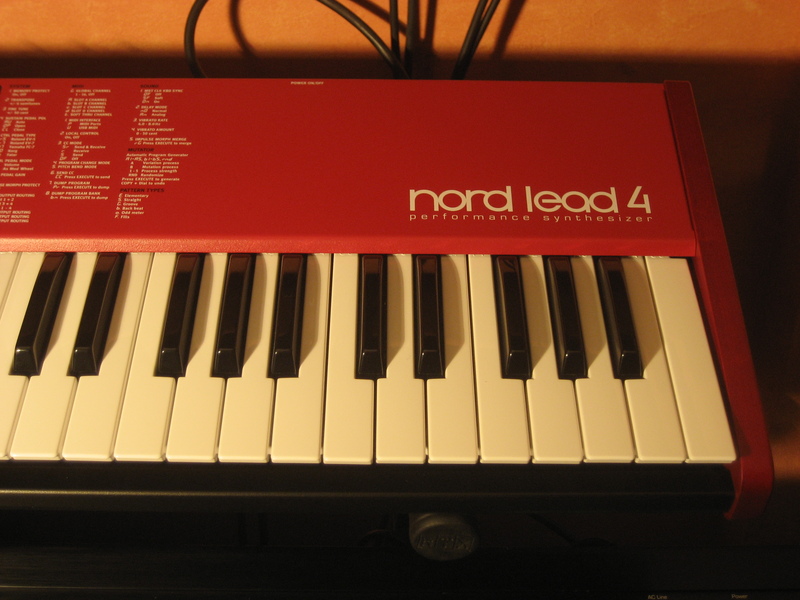 The filter section of the Nord Lead 4 is greatly responsible for the sound quality. There are low-pass modes (2 /4 / 8 poles), a bandpass mode, a high-pass mode, and two modeled filters: one from a Minimoog and the other a TB-303. Far from being mere toys, these new filters fulfill their role perfectly and extend the sounds of the synth. Thus, the Minimoog filter distorts at the input and resonates in a pronounced and unstable way. For its part, the TB filter distorts in the low end with a nice acid resonance that doesn't go into self-oscillation, unlike the other filters. The eight-pole low-pass allows for the creation of really gloomy sounds. The cut-off frequency varies from 14 Hz to 21 kHz. It can be modulated by keyboard tracking (1/2 – 2/3 – 3/3) and a dedicated ADSR envelope; the latter can generate a bipolar modulation to be controlled with the velocity. A Drive circuit allows you to play with the general sound coloration at the filter's output, together with the cut-off and, especially, the resonance. The signal then goes to an amplifier section with adjustable level, ADSR envelope and velocity modulation. All that for just one single voice. It can be played in polyphonic, polyphonic unison (voices detuned according to three more-or-less extensive modes) or in mono/legato (retriggered/non retriggered envelopes) modes. Glide is also available, but only for the mono modes. 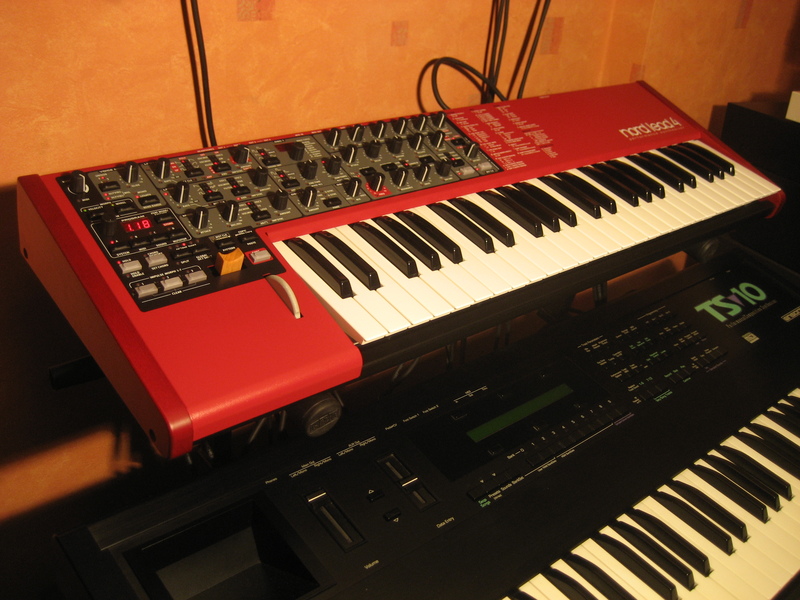 In the beginning, Nord synths were fairly devoid of effects. But that changed with the passing of time. So, after coming out of the amp, the sound goes through an insert effect that can be chosen from among six different types: Bit Crusher (Lo-fi sounds), Compressor (dynamic reduction), Drive (tube modeling), Talk 1 & 2 (two vowel-effect generators), and Comb (filter). The effects can be further livened up with a configurable parameter. Depending on the effect, it can be bit reduction, compression ratio, saturation level (from a subtle warming to the sacrifice of a piglet), the type of vowel, or the filter's cut-off frequency (allowing you to generate phaser effects with the comb filter when you do a sweep with a triangular LFO). But that's not all. It then goes into a delay or a reverb, but not both, it's either one or the other. The delay speed (echo-type only) can be synced to the internal clock or to MIDI according to different tempo divisions (straight, dotted, triplet, and swing) and within the given range (20 to 1,400 ms). Cool! You can also control the feedback (number of repetitions). The reverb is available in three sizes (Room, Stage, Hall) and features bright and dry/wet controls. As mentioned before, it sounds a bit metallic, so go easy on the brightness! The effects can obviously be disabled with the appropriate button. Unfortunately, we lost the Nord Wave's three-way position chorus, which is a real pity because it really knows how to do the job. 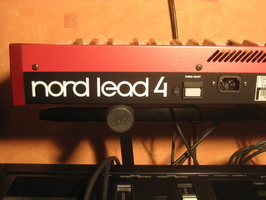 To modulate the sound, Nord Lead 4 provides two LFOs and three envelopes. LFO1 offers six waveforms (square, two reverse sawtooth, two sawtooth, triangle). The frequency varies from 0.03 to 523 Hz and can be synced to the internal clock/MIDI, finally! We can replace the waveform with one of the 60 internal patterns to achieve more complex and less repetitive rhythm effects (you will need to read the manual to understand how it works). LFO1 can modulate one of the six following destinations: oscillator mix, oscillator modulation, oscillator 2, volume, pulse width (if available), and filter cut-off. The modulation amount is bipolar. The cycle can be triggered by the keyboard or by pressing an Impulse button. LFO2 differs from LFO1 only in the waveforms (square, reverse sawtooth, sawtooth, sample & hold, smooth random, triangle) and the destinations (oscillators 1/2 and 1+2, oscillator modulation, filter, panorama, and the oscillator modulation amount). LFO1 can be replaced with a simple and original arpeggiator. The latter syncs to the internal MIDI clock, and has a range of four octaves with different modes: up, down, alternating, random, and polyphonic. In this latter case, the entire chord is arpeggiated, which is very cool. Like with the LFOs, we can use one of the 60 patterns to set the rhythm of the arpeggios. The arpeggiated notes aren't transmitted via MIDI, at least not with the current OS version (1.1). There's also a vibrato (a simplified 3rd LFO) that you can trigger with the wheel or two delay settings. Finally, there are three envelopes on the Nord Lead 4. The two ADSRs are exclusively assigned to the filter frequency and volume. The third envelope, AD / AR type, is assignable to one of the seven following destinations: oscillators 1/2 and 1+2, oscillator mix, oscillator modulation, oscillator modulation amount, and the LFO2 modulation amount (speed would've been better, but that's something that can be solved easily, as we will see). The modulation amount is bipolar, and the envelope can be retriggered by the Impulse buttons. The times for all envelopes are 0.5ms to 45s for AD segments and 3ms to 45s for the Release. A rather well though-out section whose only point of criticism are the two fixed ADSR envelopes. 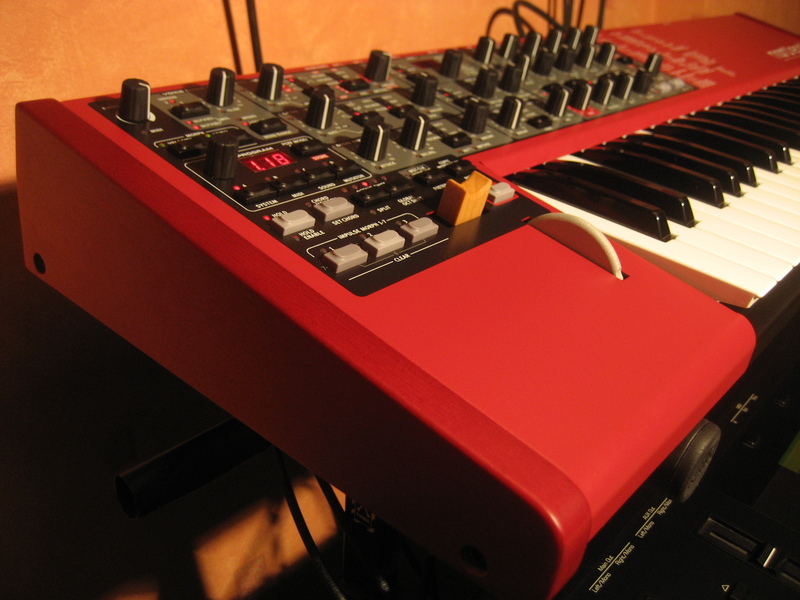 The absence of a real modulation matrix on the Nord Lead 4 is compensated by two features that we would like to find more often: (Continuous) Morphing and Impulse Morphing. 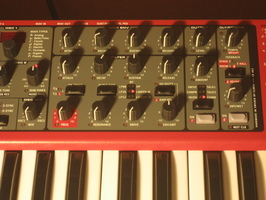 Continuous morphing, already present in the Nord Wave, allows us to move progressively between two groups of continuous parameter settings (limited to those parameters with dedicated knobs), including LFO speed/amount, oscillators detuning, intermodulation, mix, filter frequency, resonance, envelope segments, output level, effect level. The progressive morphing from one profile to the other is done with two distinct sources: velocity and modulation wheel + continuous control pedal (the two latter have the same destinations and settings), with 25 and 35 destinations, respectively (some of which are shared). The affected parameters are immediately visible, thanks to a green LED that lights on when you press the two morphing source buttons. The settings are super simple to program: you just need to hold one of the two source buttons and move the knobs to point to the desired position and then release it. Very intuitive! We can also copy and paste a group of settings from one morphing source to another. Let's move on now to the real innovation in Nord Lead 4: Impulse Morphing ─ the possibility to briskly switch from a group of settings to another one by pressing one single button. In fact, there are three buttons whose combinations allow you to have seven different groups of settings per program. This time, the morphing covers almost all synthesis parameters (55 destinations), whether they're continuous or discrete, including: oscillator waveforms, intermodulation types, filter types, effect choices, which would be impossible to do with continuous morphing. And that's how a boring bass can become a monstrous chord in the blink of an eye. You can mix two Impulse profiles with a key combination (Merge function) or create completely different Impulses. We would've loved a "hold Impulse" function that would allow us to hold the Impulse effect after releasing the corresponding buttons, to enable two-handed play, maybe in a future OS update if users request it? In any case, it's a very original section that definitely compensates for the lack of a modulation matrix! When it came out, we criticized Nord Wave's bi-timbrality, but Nord Lead 4 might appease us, considering that it allows us to gather up to four programs in Performance mode. And when we say four programs, we mean four programs and all associated parameters, including Morphing, Impulse, arpeggios and effects. Awesome! To activate several Slots, you just need to press and hold a Slot button (ABCD) and then press one or several more. The same applies to mute a Slot, instantly! To change one of the four programs of a Performance, press and hold the appropriate Slot button and select the desired program with the dedicated encoder. To edit a program, you just have to select the Slot (the corresponding LED will start flashing) and tweak the sound. It couldn't be more intuitive! To edit a parameter for the four programs at the same time, press and hold Shift and tweak: all modifications are relative to the saved values. Programs are edited independently from the original programs within a Performance, so each preserves its own settings. Well done! The Performance mode is also where you create splits, layers and multi-timbral sounds. But not everything is nice and easy: there's only one programmable split point around which Slots AB and CD pile up. It's impossible to create more than two zones (bass + pad + solo, for instance). When you use several Slots without a split, they are assigned to the entire range. Not very flexible. 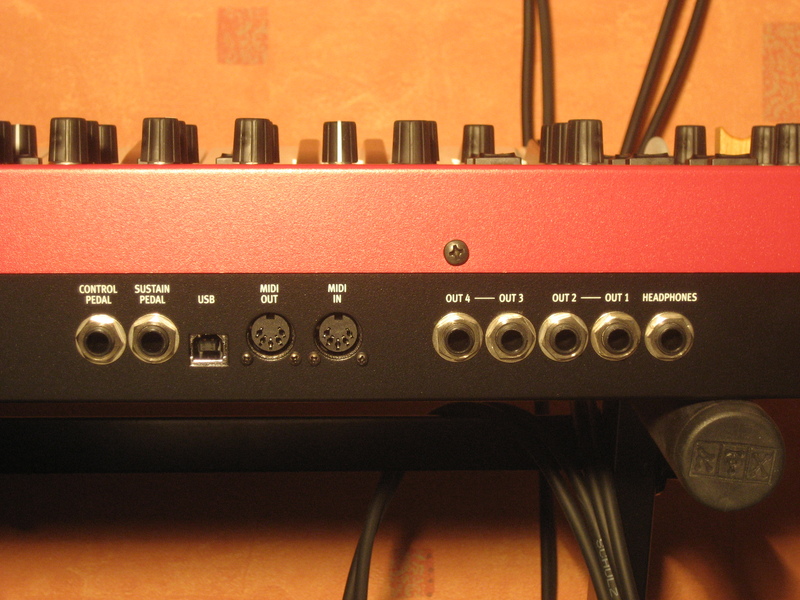 For each Slot, we can choose the audio output (1, 2, 3, 4, 1 & 2, 3 & 4) and MIDI channel. 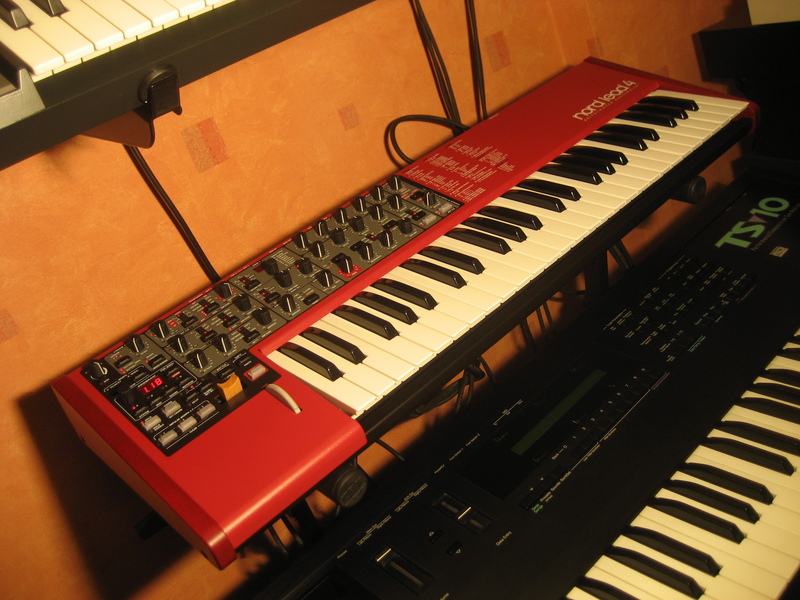 If the MIDI channel of the Slot is different to the global channel, the Slot sound is only controlled via the MIDI/USB input, since the Nord Lead can only transmit on one channel (notes, CC, Sysex for automation and dumps). A Slot that is disabled or assigned to a MIDI channel other than the global channel is nevertheless controlled via the MIDI/USB input. This makes the Nord Lead 4 multitimbral and multichannel. And, as such, it can receive MIDI data (notes, CC, Sysex) on each MIDI channel, which is ideal for automation from an external sequencer. 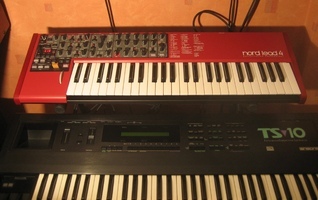 In the end, the Nord Lead 4 carries on with the tradition of the Nord Lead, Nord Lead 2 and Nord Lead 2X in terms of sound and design (Nord Lead 3 and Nord Wave are, in our opinion, a bit different). Capable of combining several types of synthesis (analog modeling, FM and digital microwave), we loved it for its sound quality and versatility. And it sounds awfully good! The different morphing modes, the return of the arpeggiator and the new effects are great assets, especially considering that they are multitimbral and four-part independent. Where the Nord Lead 4 falters is its keyboard, which is certainly not up to the standard in this price range, particularly as it lacks aftertouch. 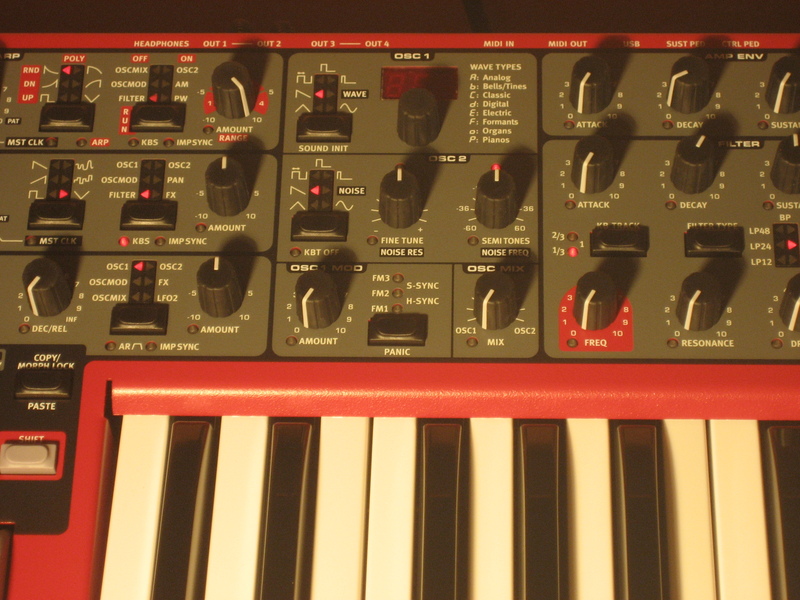 Moreover, the Nord Lead 4 also lacks an audio input, effect parameters, a chorus, and a more flexible multitimbral zone management. Its easy handling will please wealthy beginners, while its advanced synthesis possibilities will suit experienced sound designers. And, finally, its sturdy and light construction make it ideal as a stage keyboard. So, in short, there's something to please everybody! 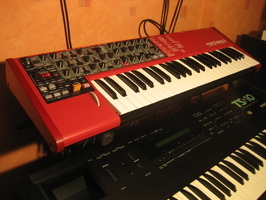 We would like to thank Thomann for kindly lending us the synth for the review.